What a nice assortment of cards! Looks like we had the same idea for the MIM card!! Once again you have given us so much prettiness to drink in!! I love the sympathy card, it's just perfect. The second with all of those bubbles is super fun. And I have lawyers loved the PTI simple sunflowers! Three fabulous colors. All of them with impeccable stamping! Three wonderful cards, love the colours used for each. Loving this creative trio. So different and so inspired. The wood grain bg on the first card just jumped from my wish list to my cart! Laughed when I saw your MIM card because it's so much like Lainey's. Love the woodgrain! Great minds think alike as it's lovely. Your second one is a fun one, and the third one has those green sunflowers just popping off the card. All three are perfect, Joyce! WHat a great trio of cards, Joyce! The confetti bubbles are perfect behind the curved opening on the second card! 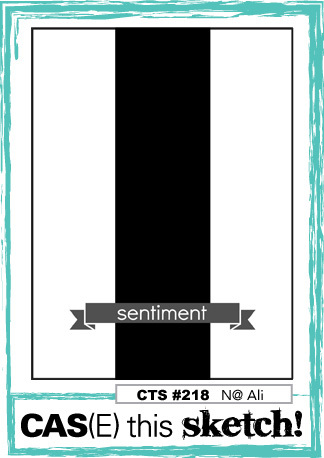 I've just pinned your teal sunflowers card--I love the color and the big bold sentiment. Thanks for inspiring me today. love those beautiful berries- just like the trees and hedges at the moment. Fabulous cards with great use of pattern. Wonderful cards, Joyce! I used the same stamps for my MIM card, but love how you paired them with the woodgrain pattern! And your take on the CTS sketch is very sweet and fun! Love that solid sunflower stamp! So glad you joined us at Muse this week, Joyce! Oh....looks like you had a productive weekend stamping. Love your wonderful collection of cards. Your blue sunflowers are just stunning and I love that you changed up the color, so beautiful. Love the wavy design! So cool! Looks like you had a great time in your craft room this weekend! Your cards are so pretty...especially the sunflowers! I love that you chose a non-traditional color palette for them! I love your weekend recaps, Joyce. You always have such loveliness for us, like those blue flowers around the die window. The colorful bubbles are great for a birthday card, especially inside that curvy die, and the sunflowers in blue are perfectly stamped. All three are pretty and elegant!!! 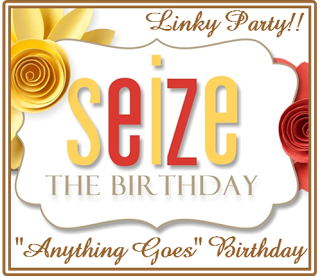 Love the wavy cut out of the card you entered at Seize the Birthday! 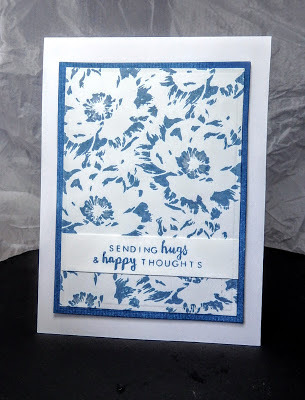 The cheerful bubble pattern paper is perfect for a birthday card! Thank you for joining us!